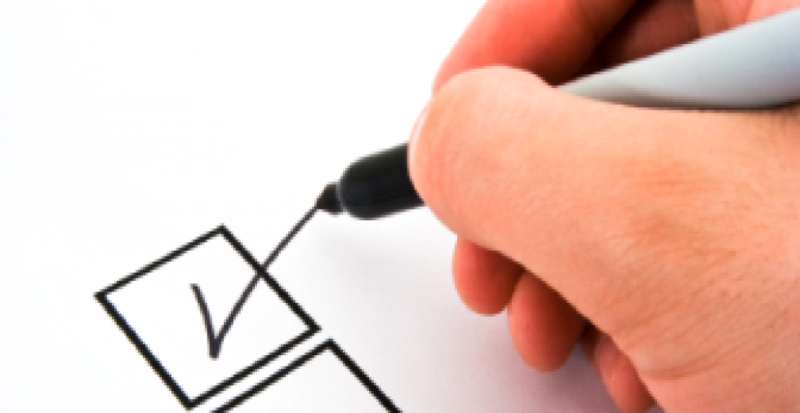 Editor's Note: This post was originally posted in May 2016 and has been completely revamped and updated for accuracy and comprehensiveness in June 2018. Stash away out of season clothes. 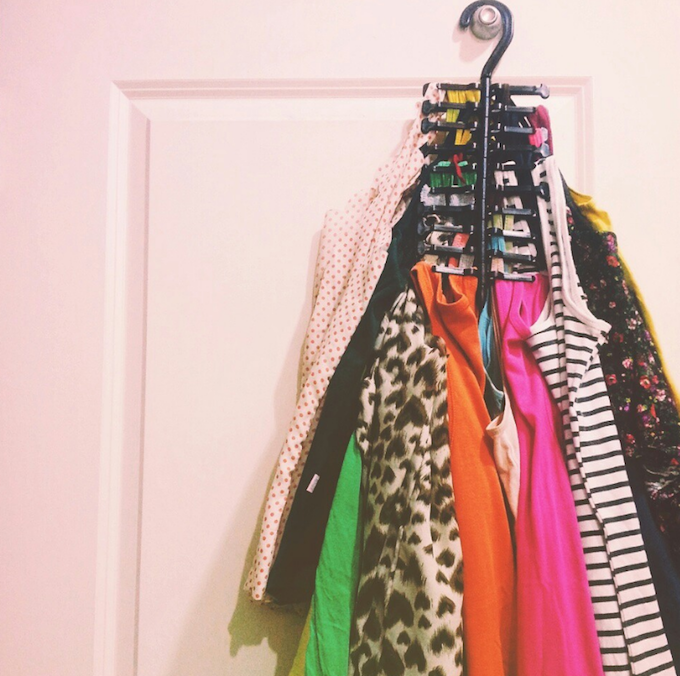 You'll be surprised at how many pieces of clothes you've not worn for years. 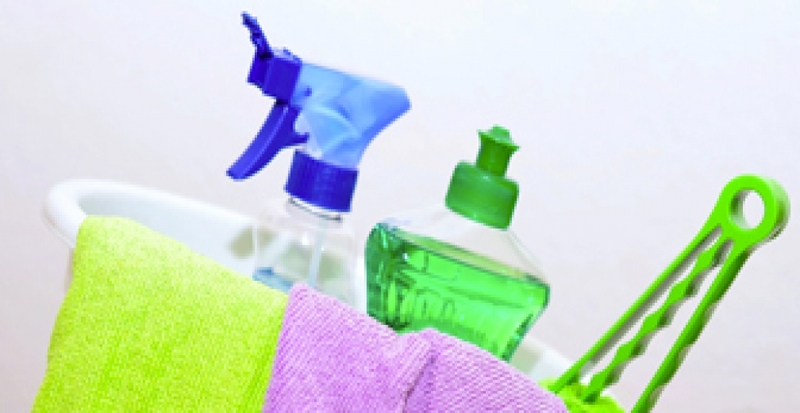 With the start of a new season, now is the time to donate or sell - you could even make some money on your spring clean. You want to organise your tiny wardrobe so the items you wear most weeks - think jeans, comfy jumper, work shirts - are the most accessible. 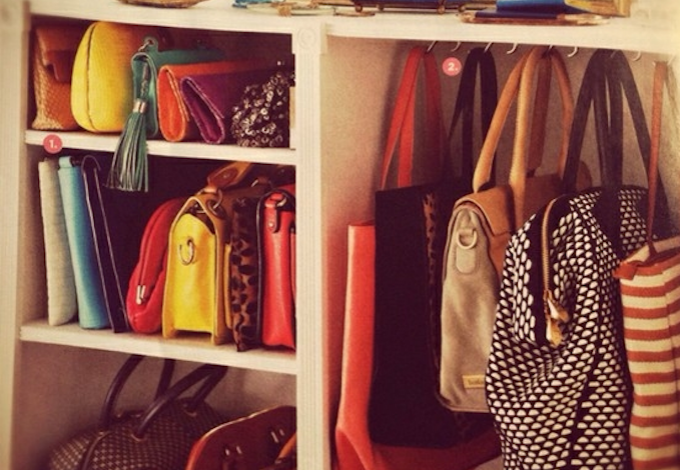 Everything else can be hidden away in areas of your wardrobe. Every item you hang in the accessible areas should be worn at least once, if not you can move it to your occasional sections. 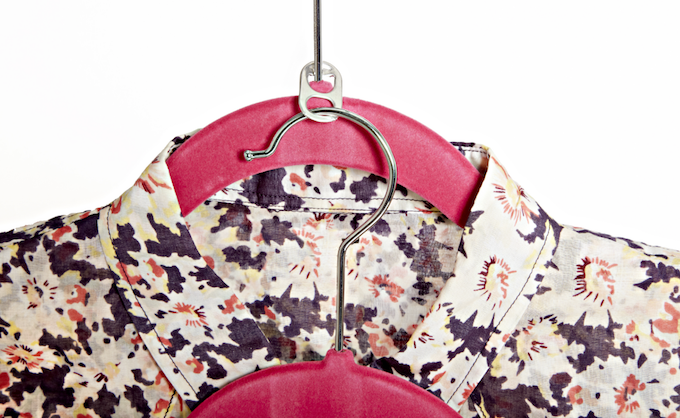 Coat hanger hacks will give you so much more space in your tiny wardrobe. 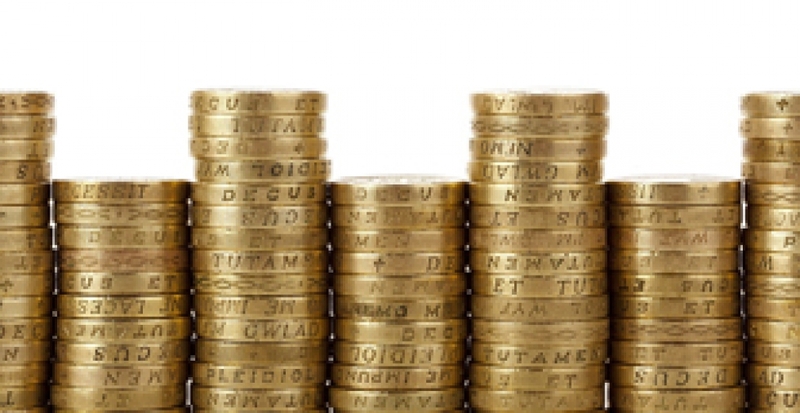 Discover the handy tips below to make the most of your space. 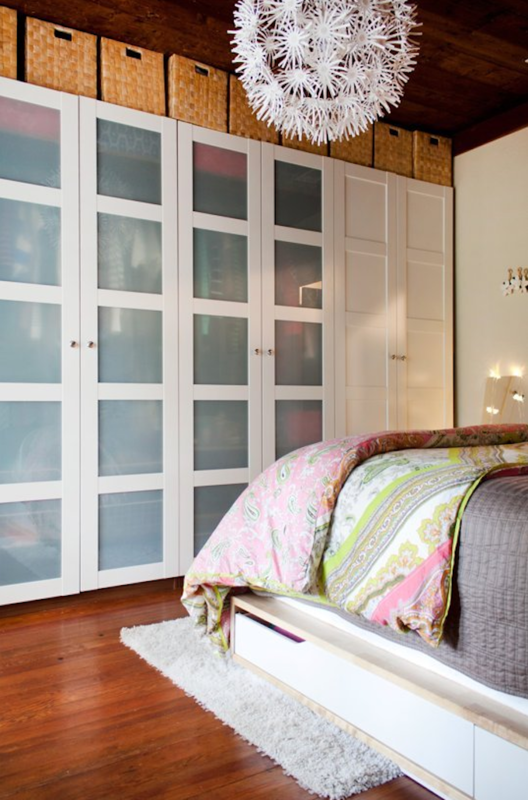 If you have a narrow wardrobe that's also tall, this is the ultimate space saving solution! 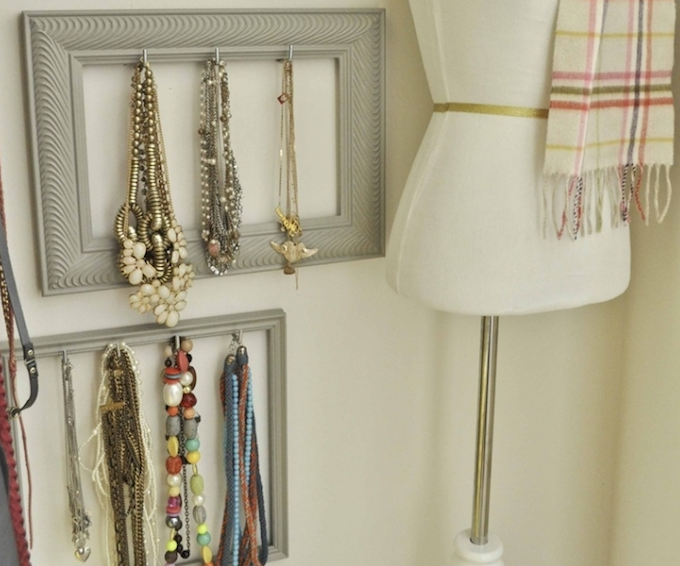 Inspired by this brilliant idea from Brit + Co you can use a cheap metal chain and an S clip to hang your t-shirts and other short clothes. 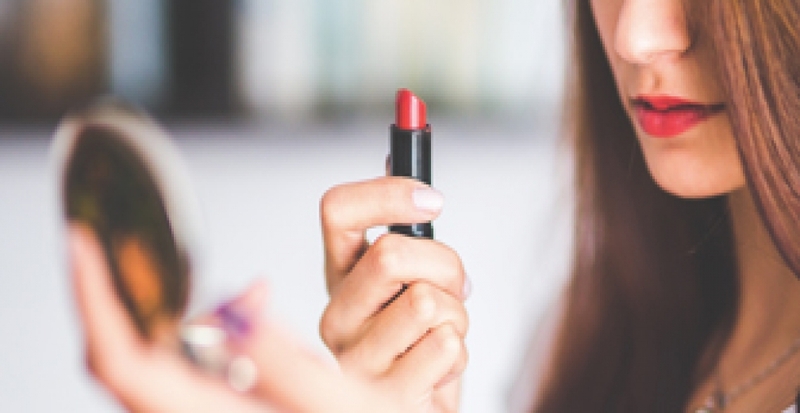 This trick is just for those everyday items that you wear week in, week out. I'm talking scarves, belts, hats and more. Attach shower ring pulls to a coat hanger as per the image above to hang these items. This will remove the need for clunky accessory boxes, freeing up more space in your tiny wardrobe for more important things. 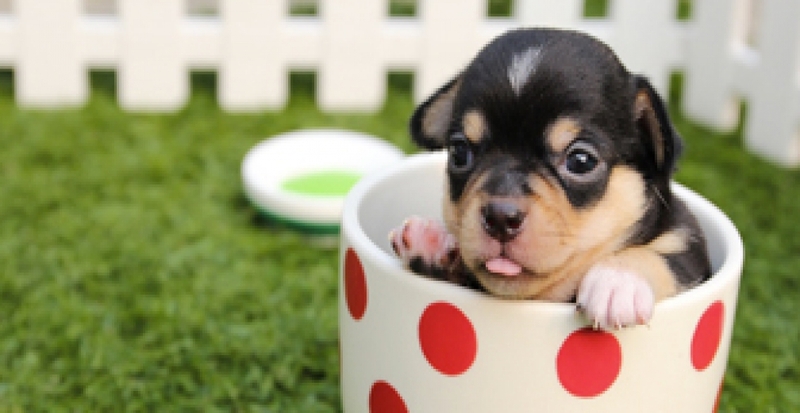 Pic credit: Two Twenty One - check this blog post out for smart baby organisation tips. 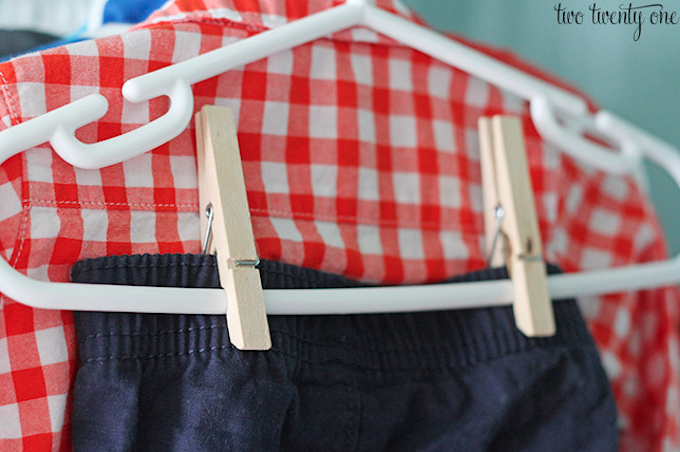 Use pegs to clip your trousers or skirts to the bottom of your hangers. This is a genius tip if you're planning ahead and hanging up your week's outfits (this will save you time and space) or you could double up on T-shirts, tops and any other lightweight items of clothing. Don't let your strappy tops (or other pieces of clothing you might have multiples of) take up all your precious tiny wardrobe space. Purchase a cheap tie holder and use the straps to hang your tops up. 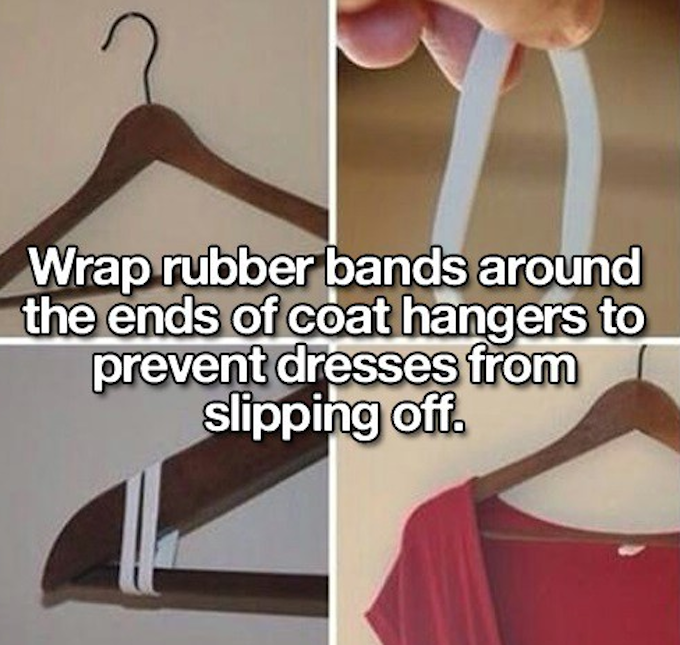 This is one of our favourite wardrobe hacks of all time! Handbags have a tendency to end up on the floor (and get ruined) so why not utilise any spare hanging space by screwing in some hooks? These can then hold your handbags and other accessories and free up your floor. 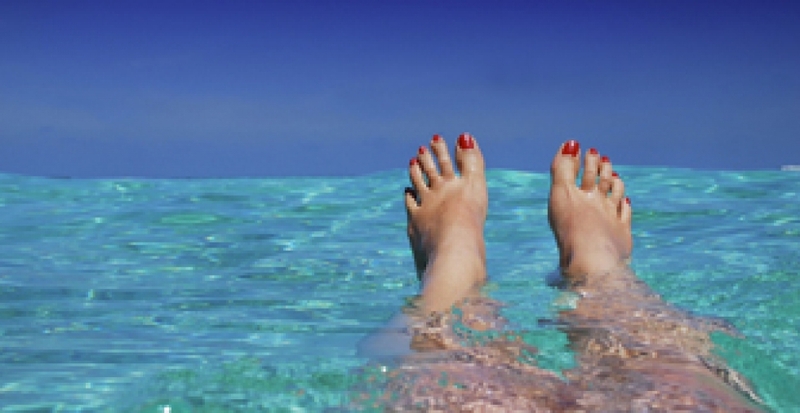 During the warmer months, you should be storing your heavy Winter footwear like boots and wellies away. Summer footwear tends to be lighter but that doesn't mean it doesn't take up valuable space in your tiny wardrobe. 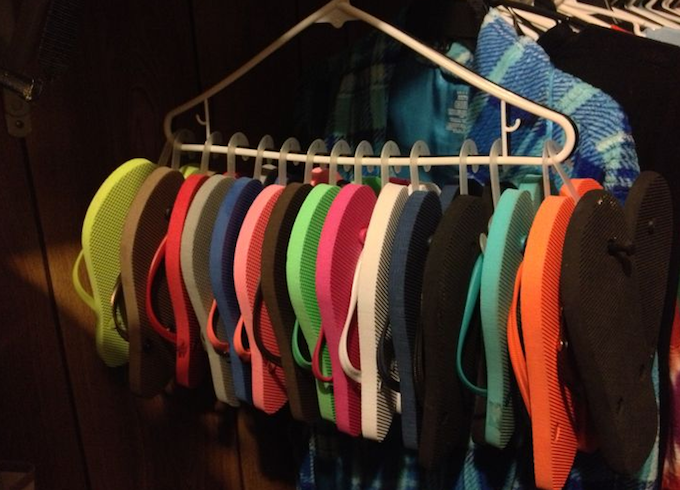 Use plastic shoe hangers or bend wire coat hangers to create little hangers for your sandals and flippies. Pic credit: Epbot - click for a easy-to-follow tutorial. Use every last inch of space. The back of the wardrobe is every tiny wardrobe owner's paradise - a completely free space that is yours to hang all those daily essentials that can be grabbed easily in the morning. Hang coat hooks, rods, attach mirrors and all sorts, it also makes a fantastic place to hang those items that usually end up on the bedroom floor when you come through the door (coat, handbag, tie etc). 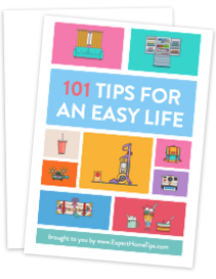 For more handy hacks check out my article on smart bedroom space-saving ideas. Rails are handy for all accessories and shoes. Buy a cheap towel rail and secure it to the inside of your wardrobe and slot your flat shoes into them. You can also double up and use them for scarves and belts, too. 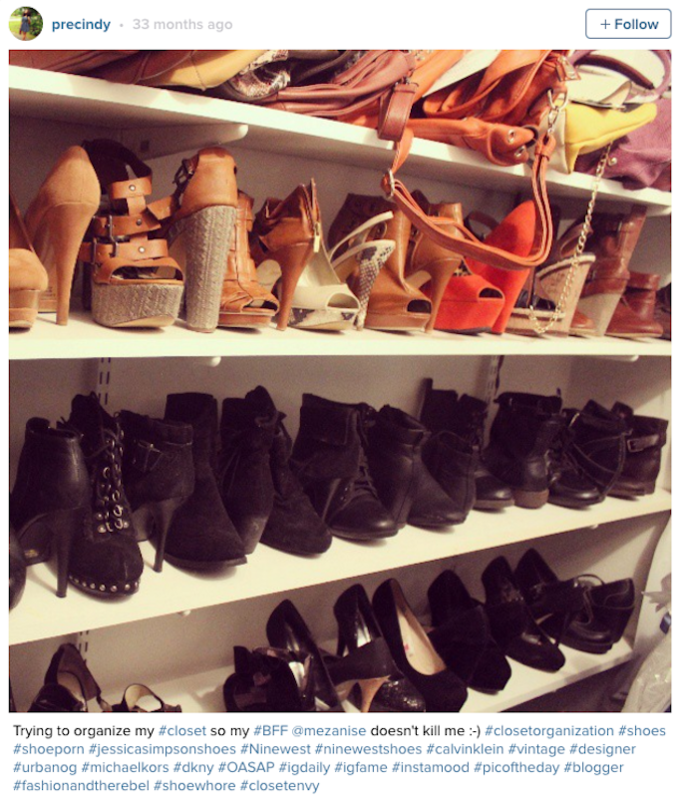 For more shoe storing tips check out my 32 incredibly clever ways to store shoes. Railings on the back of the door are the perfect addition to any tiny wardrobe. 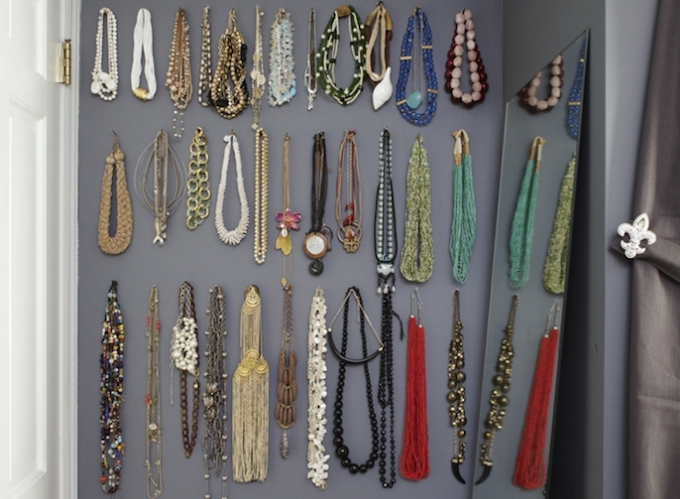 You can hang shoes with S clips, scarves and belts by looping them through, and necklaces by clasping them around the rail. Clever! 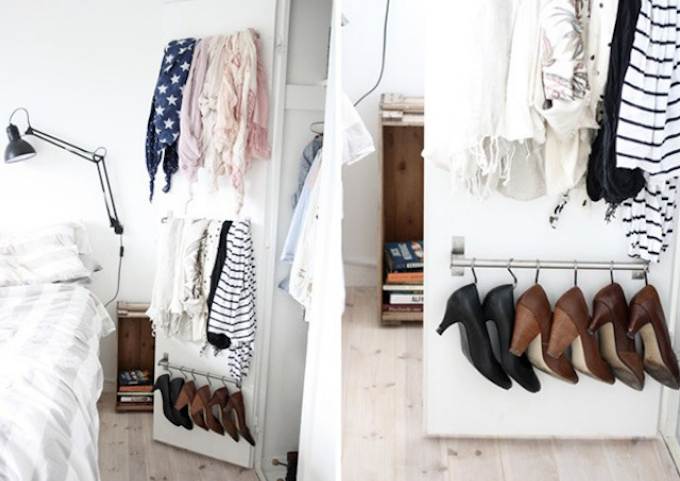 A double hanging closet is essential. 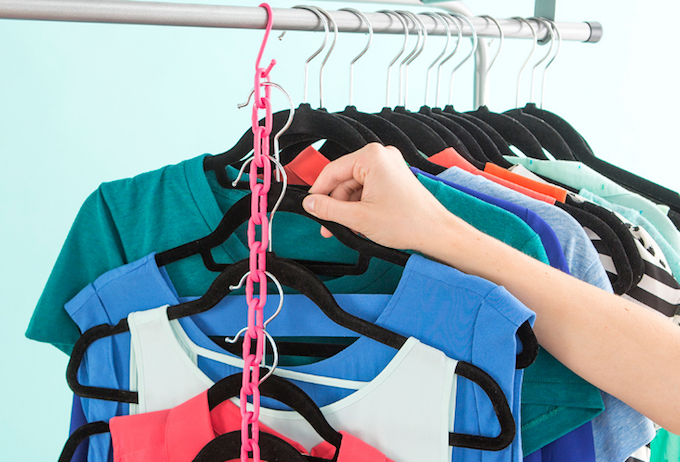 If you're looking for easy wardrobe hacks that make a real difference, look no further. 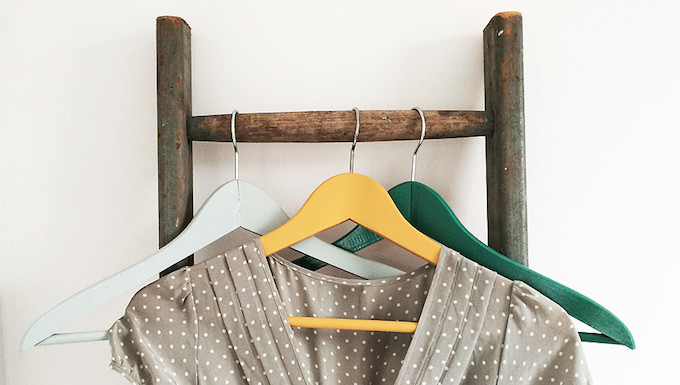 Doubling up your rails is a no-brainer if you're looking to make the most of your wardrobe space. 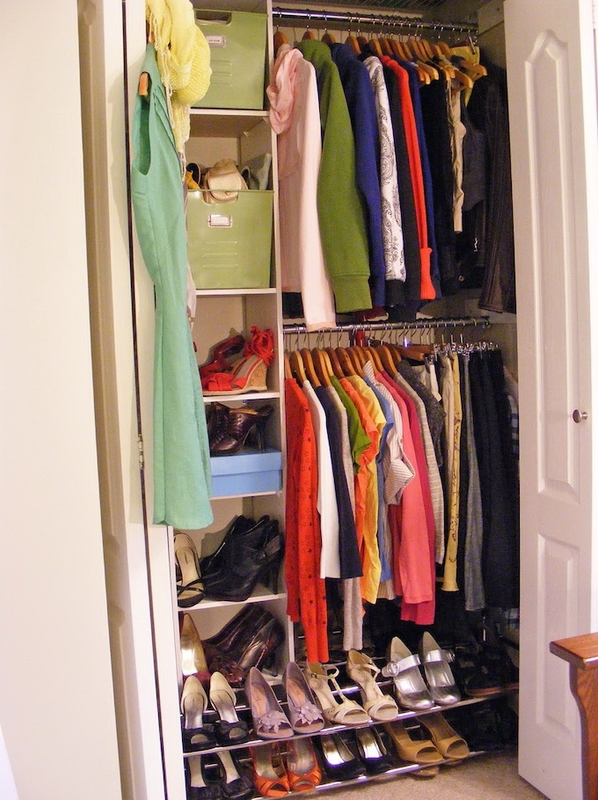 You can hang shorter items like tops, skirts and folded trousers on the bottom rail and longer items on the top. Got a really tiny wardrobe? Triple your available hanging space with a simple and inexpensive extender rod! It can be adjusted to suit your wardrobe and the seasons. In the winter you're more likely to store longer coats and cardigans so you can simply adjust the height of the rod. 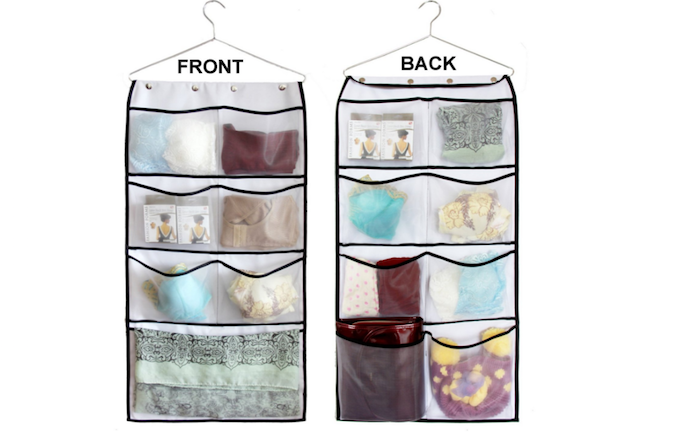 This Organise it All 'Closet Doubler' rod from Amazon is only £17.99 with free delivery. 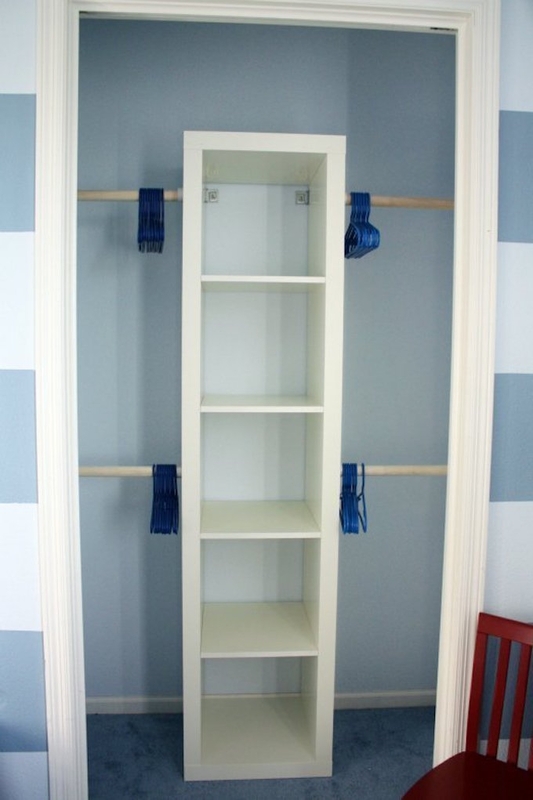 A great space-boosting solution for a small wardrobe! Need some additional shelving for your folded clothes? If you're not the handiest of people don't, consider adding a wardrobe organiser in the form of this IKEA Kallax squared storage unit (£30). 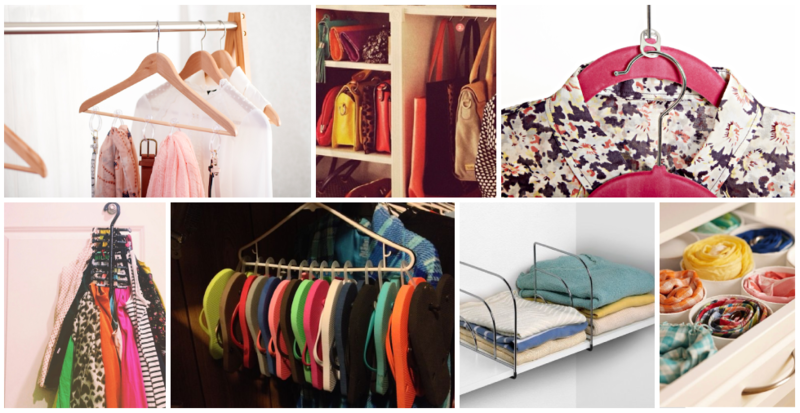 You can place it vertically or horizontally, depending on what fits best in your tiny wardrobe. You can store foldables, shoes, accessories and underwear in these roomy boxes. Make use of spare heght. The wardrobe pictured here may be huge, but you can take heed from the use of storage boxes above it. It's the perfect place to keep those out-of-season items out of your wardrobe, freeing up space for more important things. Use the height to your benefit and invest in some pretty baskets or storage boxes to keep items you don't need every day. Great if you have a narrow wardrobe. 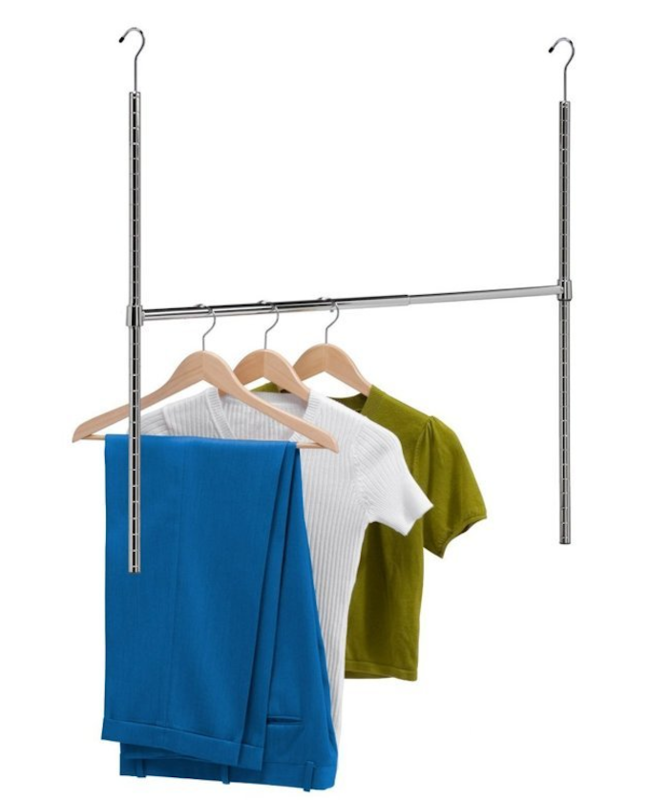 This hanging wardrobe organiser (£13.99) hangs in your wardrobe and takes up the smallest amount of space. Ideally sized for underwear, socks, scarves, jewellery and belts, you can fit a surprising amount of items in it. Separate your shelves to keep it tidy. Shelves are great for storing foldable items of clothing but if you're anything like me it'll soon be a mess in no time. 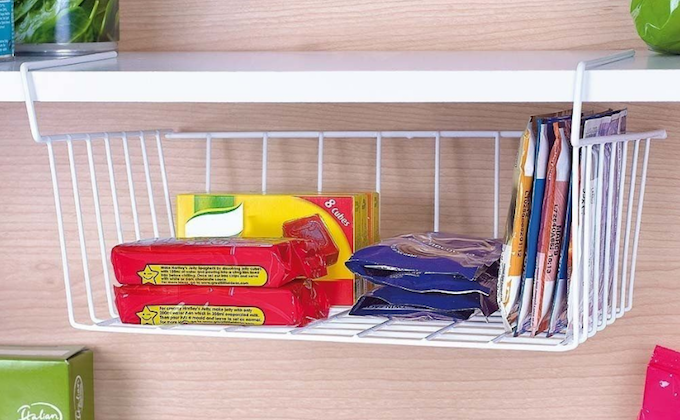 Order these shelf dividers from eBay (£9.85) and keep your clothes neat and tidy. Separate your clothes into different items of clothing and not only will your tiny wardrobe be super-organised, but it'll be a lot easier to pick out your clothes in the morning too! 17. Don't forget to use the space under your shelf too! A great product for around the home. If you're hanging shelves or have existing shelving, make sure you utilise the space underneath them. 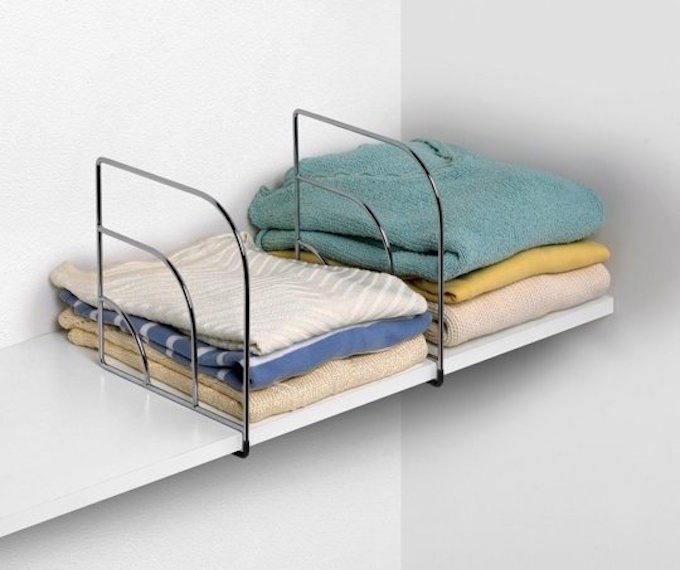 This cheap metal shelf from eBay (£4.49) can easily be used in your wardrobe to store accessories or more clothing like pyjamas and underwear. Pic credit: precindy - check out this fabulous Instagram account for more wardrobe inspo. If you have an unholy amount of shoes, be sure to be storing them in this way to maximise your wardrobe space. You'll be shocked by how many more shoes you can line up (freeing you up to buy more)! This also works with hair ties. This little hack keeps your slippy clothes in place and can also enable you to double up and keep more clothes hanging on one hanger. 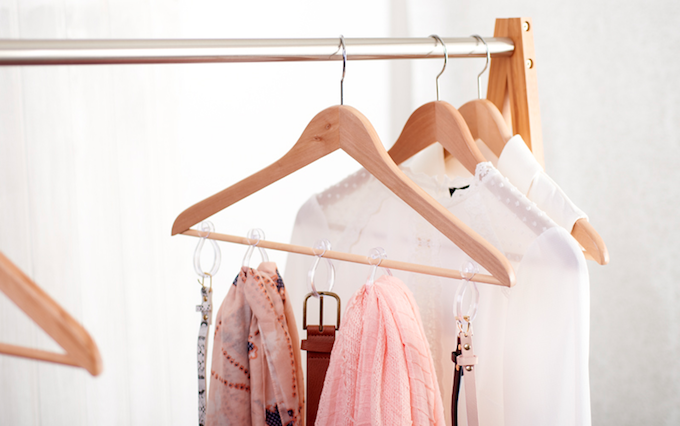 Double or even triple up by hanging camisoles, dresses and other light items on just one hanger. Grab your hammer and some nails and bang them into the sides of your wardrobe. You can use the nails to hang jewellery like the photo above. With some S clips you could even hang larger accessories too! A ladder makes a fantastic addition to the inside or outside of your wardrobe. Just prop it up and hang clothes or accessories on it. 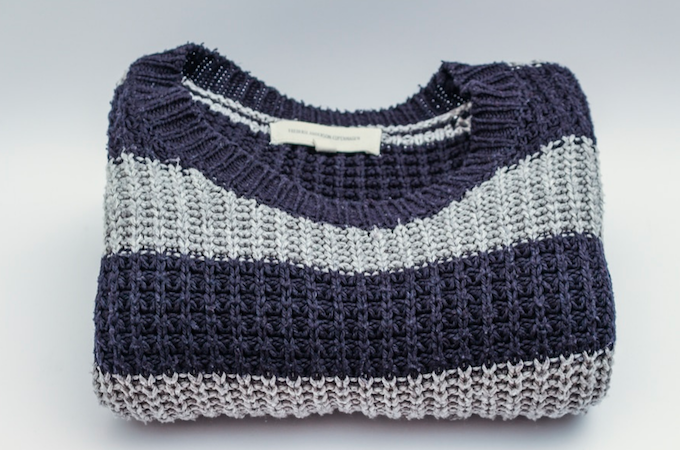 One of the easiest wardrobe hacks and it looks pretty too! 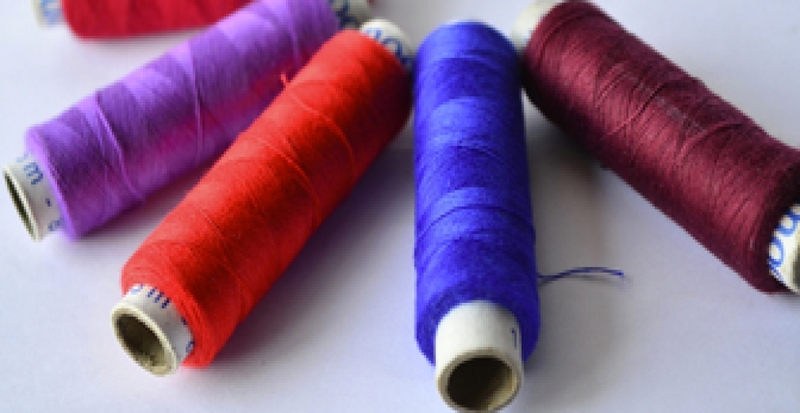 Do you have any wardrobe hacks you'd like to share? 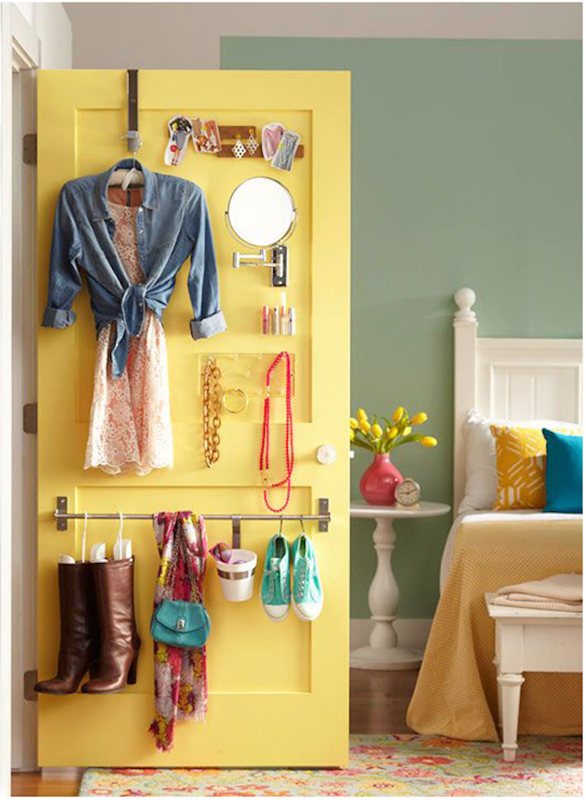 Tell us how you maximise on space in your tiny wardrobe in the comments below! Be careful that you don't pull the door off its hinges - or drag the rail off Just have less but better! Thank you so much for those wonderful tips . You're welcome Anne! I'm glad you're enjoying the tips. 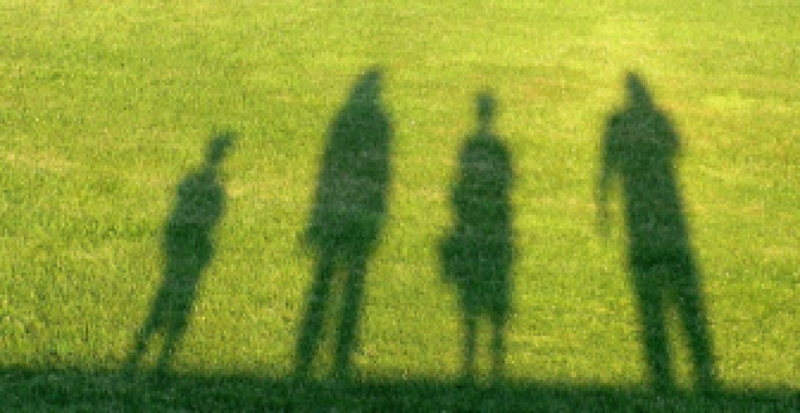 Thank you for some great tips, I look forward to read some of the new ways to look at the problems we have sometimes . Here's another little tip for the space in your wardrobes, keep your old shoes boxes, they are not just for shoes,. I put my holiday gear in them or hide Christmas, birthday presents in them they do hold quite a bit, and if you get boot boxes you can put 2 pairs of shoes in them or presents or clothes. More idears please. Some fab ideas there Ann thanks for sharing! I like to keep nail polishes, and jewellery boxes in my shoes boxes. No worries, I'm glad you like them! I keep my shoes in a box under the bed - along with old soaps as i have unsavoury feet! I also keep unused handbags in an overnight bag to keep them dust free. 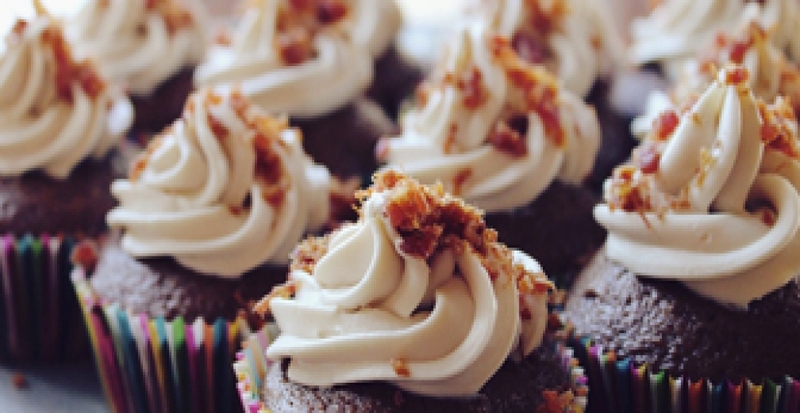 Great tips Lesley, thanks for sharing! Thank you for such useful tips. I will reorganise my wardrobe this weekend. Excellent ideas and many thanks! My wardrobe was transformed when I bought a clothes folder. I wasn't sure if I'd use it, but my wardrobe has gone from untidy piles to neat sections. I wear many more of my clothes now, as I can actually find them and see them! I have tried the idea of the shower hooks on a hanger for tank tops, the only problem I have is they tend to slide to one end and tip and clump up. Any suggestions for this?